Autoshock Shock Absorbing Tow Bar - Automatic Systems, Inc.
Autoshock Shock Absorbing Tow Bar: Industrial conveyors, including Power & Free type systems, typically use a tow bar to connect the lead trolley to the load carrying trolley(s). Starting and stopping the loaded carrier can impart significant impact forces to the carrier and parts being carried. These impact forces generate noise and can cause damage to the system components and to the parts being carried. The addition of an Autoshock to the carrier tow bar cushions the starting and stopping action. This cushioning effect greatly reduces the impact forces thereby reducing noise, wear and tear on the system and damage to the parts being carried. The Autoshock is suitable for both overhead and inverted power and free conveyor systems, as well as other towed carriers. The unit is short and compact. It can be easily adapted to or replace existing tow bars. Autoshock II has been re-designed to provide substantial improvements in reliability, durability and maintainability. ASI’s new tow bar shock absorbing device has the same capabilities as our previous design with many practical improvements. The new unit is still completely free of hydraulic fluids, has greatly improved performance at high temperatures, is resistant to paint adhesion and nearly impervious to solvent attack. 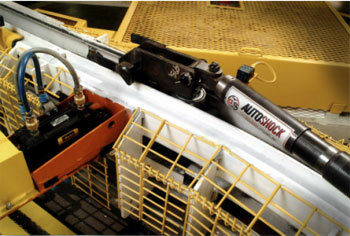 Autoshock II can be field adjusted to fit changing load conditions and to accommodate existing equipment. Adjustment of the device can be performed on the carrier with simple hand tools without removing the carrier or the tow bar from the system. Autoshock II is capable of absorbing multiple consecutive impacts as can be seen in long accumulation banks and chain-to-chain transfers.